Local Monterrey family business owners become first Park Lane Jewelry Franchise Owners in Mexico. Schaumburg, IL, November 10, 2017 --(PR.com)-- Pioneer in the direct sales industry for 62 years, Park Lane Jewelry, has officially launched the newest franchise in Monterrey, Mexico beginning November 9th, 2017. With Mexico experiencing stagnant growth and growing unemployment, Park Lane will be committed to offering all of Mexico the opportunity to own a home-based enterprise backed by a well-established, debt-free, Direct Sales Jewelry giant. 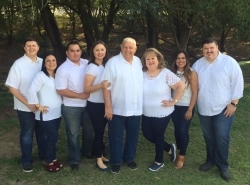 Family business partners Jorge and Esteban Arjona & sister Jannet Cuevas will be the newest Park Lane Jewelry (Subsidiary of Jewels by Park Lane US) Franchise Owners/Operators in Monterrey, Mexico. All have a long history of success within business. Jannet will operate as the field leader, mentor and coach. Jannet’s passion and energy drove her to find the very best Direct Sales opportunity in the world, and bring it to the women and men of Mexico. Jorge & Esteban have over 20+ years of experience as top business leaders here in Mexico, and bring extensive experience and creative marketing back grounds to the Park Lane Mexico team. Both are excited to be launching this amazing opportunity. Park Lane Jewelry, based in Schaumburg, Illinois, USA is a second-generation family-owned-and-operated company. Park Lane was founded in Chicago, in 1955, by Shirley and Arthur Levin. Through their efforts, the company is today recognized as the leading fashion Jewelry direct sales company, known especially for its generous representative, hostess, and customer programs which include guaranteed products, no-product buy-in at startup, and high-quality fashion Jewelry. Park Lane offers the perfect solution to mothers who wish to spend time with their children yet want the opportunity to generate income for their families. It also can be a great part-time endeavor for anyone wishing to supplement income, start their own business, or create financial independence. If you are looking to create your own work schedule, earn trips, Jewelry and prizes, then explore the opportunities available at Park Lane Jewelry. To find out more about earning free Jewelry by hosting a Park Lane fashion Jewelry get-together, or to learn about the new opportunities in Park Lane Jewelry Mexico, contact at +52 1 83679470. Visit the Park Lane website at www.parklanejewelry.mx to see what all of the excitement is all about.